Without a moment to spare, eighth graders toured from one landmark to the next, soaking in U.S. history at every turn. From the museum of African American History to the FDR, Lincoln, Vietnam and Jefferson Memorials, and from the White House to Mount Vernon, eighth graders asked meaningful questions and found answers. Before the trip, students were each assigned a different memorial that they would visit on the trip. They created a "tour guide" presentation and led a tour for their group around the memorial when they visited it. This encouraged eighth graders to take ownership of and connect to what they saw. At one of the historical sites, Arlington National Cemetery, four students, Sloane Harrison, Scarlett Gunn, Nick Dillon and Bennett Lang, participated in the wreath-laying ceremony at the Tomb of the Unknown Soldier. 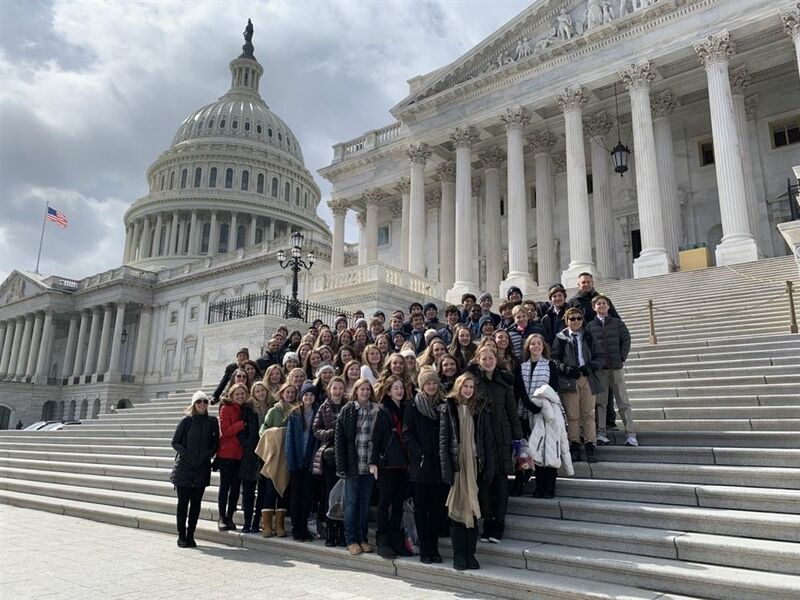 In addition to the educational experience, students and chaperones enjoyed bowling, ice skating and even a dinner and dance cruise on the Potomac! Click here to view photos from the eighth grade trip to Washington, D.C.